This is a story of Riyadh as it was many years ago. It's set in Souk Hiraj, an open air market running either side of Thumairi Street in the centre of old Diera. 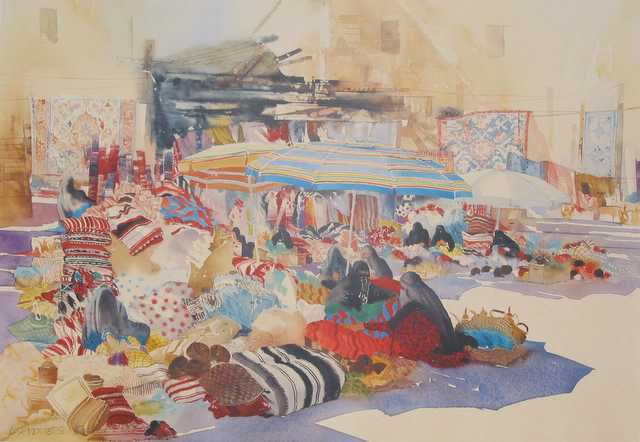 At Souk Hiraj, Bedouin women sit cross-legged on the ground under large umbrellas. Second hand dresses are piled beside them and fall untidily out of old tin trunks. 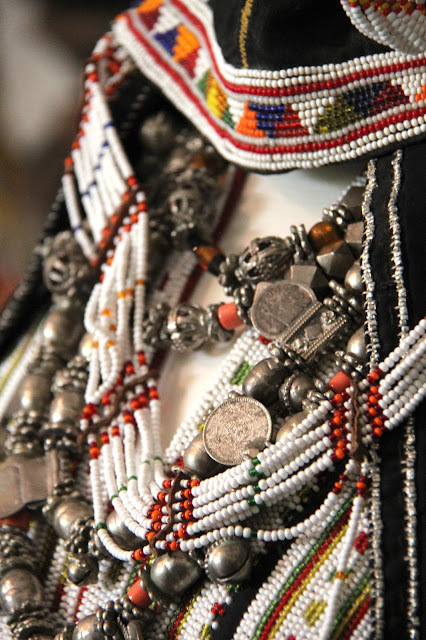 Scattered among the jumbled clothing are traditional jewellery and face masks decorated with beadwork, fringes, woven bands and coins. The air is filled with the distinctive fragrance of small bunches of basil, rosemary and jasmine, tucked into women’s dresses and held in place under headdresses. Behind the ladies’ market, goats and sheep wait noisily in pens to be sold. Still further along Thumairi Street is the men’s market where almost everything imaginable is for sale: thobes, bishts, old swords, guns, miswak. Cries of “Taille, taille," fill the air, each vendor trying to out-shout his neighbour and convince all and sundry that his wares are the best and the cheapest. There are children everywhere. Boys and girls play soccer with an old tin can. The roads are pot-holed and muddy and the dust covers everything. The year is 1978 and this story belongs to a friend who arrived in Riyadh over thirty years ago to work as a sonographer at King Faisal Specialist Hospital. 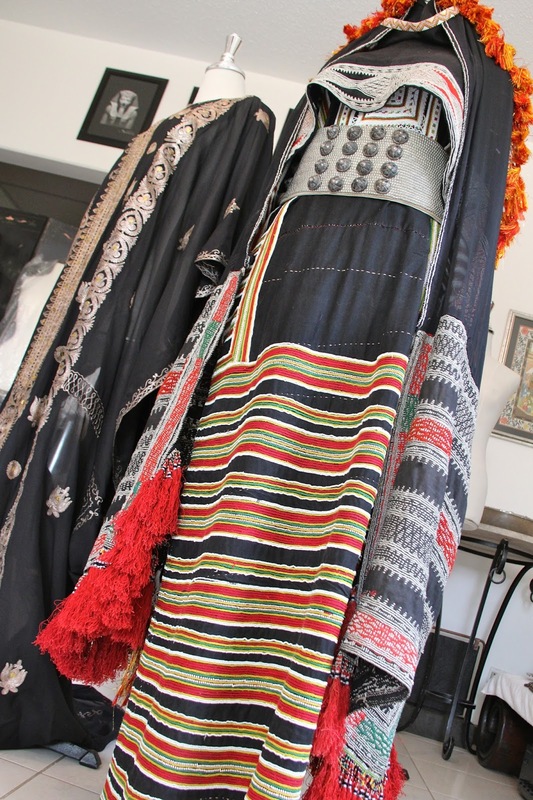 Her first visit to Souk Haraj was the start of a collection of dresses, which now numbers between four and five hundred, and spans much of the history and geography of this country. It’s a unique and astonishing testament to Pamela’s passion for the people and culture of Saudi Arabia. Last week we met together with the idea that Pamela would talk and I would write. Inside her villa I peek around the corner of the room where her collection is housed. It takes up the entire breadth and depth of the room. There are even dresses hanging from hooks in the ceiling. Despite the protective plastic covers there’s still a hint of sparkle and glitter. 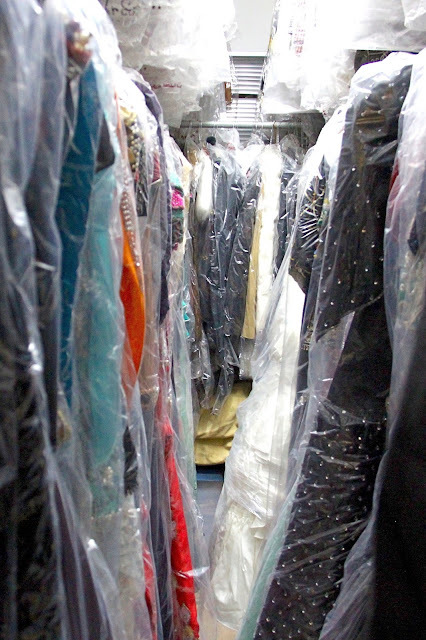 This is an Aladdin’s cave all of its own. “It was very different when I first arrived,” Pamela says, describing the souk. “All the vendors were Saudi and there were both men and women. The women wore bright dresses - Bedouin floral prints – reds, purples, greens and pinks. Abayas were really just shawls to cover heads and shoulders. Many had ink tattoos on their faces and hands and they had bare hands and feet: none of the black socks and gloves you see nowadays.” Pamela pauses, “ I remember one, her name was Um Salman. That means the mother of Salman,” she tells me, “ She’d be feeding a baby on one breast with a toddler on the other. She was as dark as ebony and wide as she was tall. We became friends.” Pamela continues, “I loved going there. After my first visit I was hooked. The dealers came to know me. They’d often put stuff aside that they knew I’d like. I wasn’t meant to go on my own. The hospital didn’t like it. But I did anyway. I’ve always been a free spirit. I'd catch a taxi and then come back with the trunk and car filled with clothing.” We laughed. I could imagine it. We turn back to the mannequins and I look at a bright yellow gown with a large geometric motif on the bodice that’s repeated over the skirt. “See,” Pamela says, showing me the underside of the skirt, “it’s just as beautiful on the inside.” She’s right: pomegranate red under sunshine yellow. The dress has other traditional Bedouin elements: a metal belt, a shawl draped over the shoulders and a head covering. 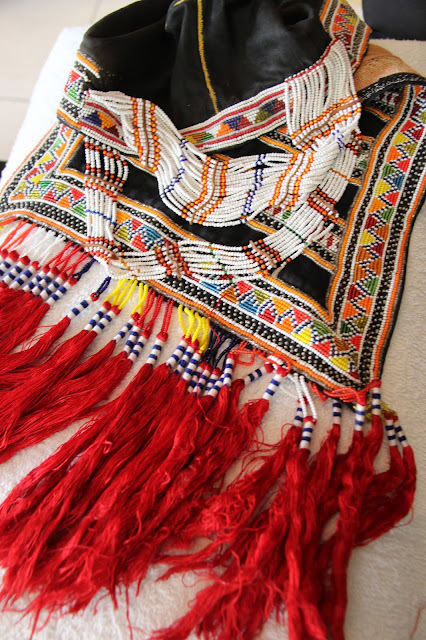 The details are what interest me most, and I’m drawn to the beads, tassels, fringing, as well as the colourful chain and back stitching covering almost every inch of the black fabric. It's such a wonderful cacophony of colour. The next mannequin in the Doctor Who line up is also bold and beautiful, but in a more kaleidoscopic kind of way. Small beads are set into intricate repeating patterns on the bodice. I notice the traditional Bedouin necklace that Pamela has added and like the way it sits on the bodice. 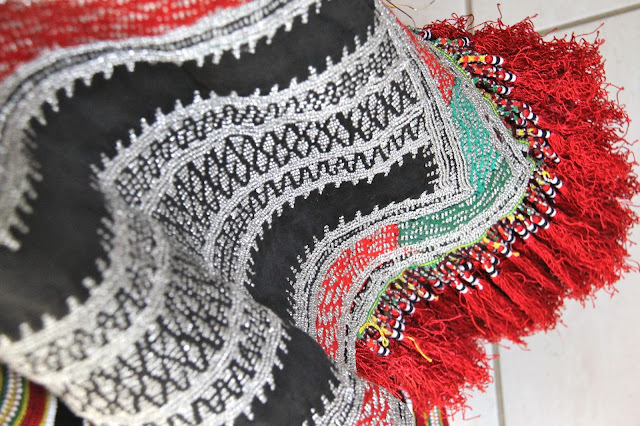 There’s a rich interplay of texture and colour, from the sheerness of the shawl draped over the shoulders, to the opacity of the skirt with its broad bands of hem embroidery. 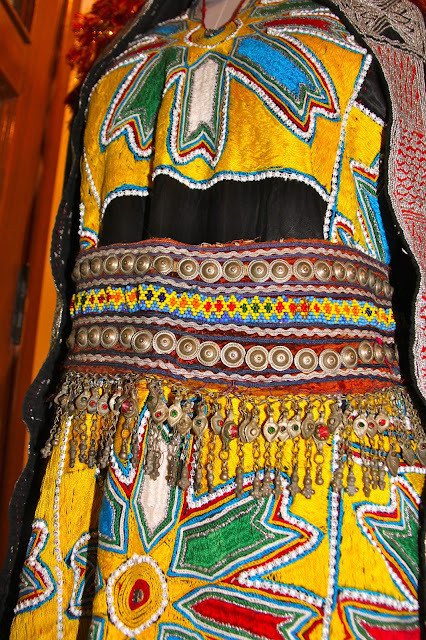 “Look at the silver metal beads,” Pamela says as I struggle to get a photographic angle that does the dress justice, “they’re all hand sewn.” This, like the previous dress, is from the Asir region, perhaps a village near Abha or Najan. Pamela turns the mannequin round and shows me the back, proving that this view is just as stunning. On a small shelf near her front door just above a shoe rack, Pamela has placed a traditional burqu (face mask). I look at the small slits for eyes and the coins sewn on as decoration, and can't help thinking how heavy and uncomfortable it must have been. Along the bottom there are metal pendants with small bells, and two tassels fall either side of the face. There’s embellishment everywhere. Later we take it off the stand and look at the inside to see row upon row of small neat stitches. 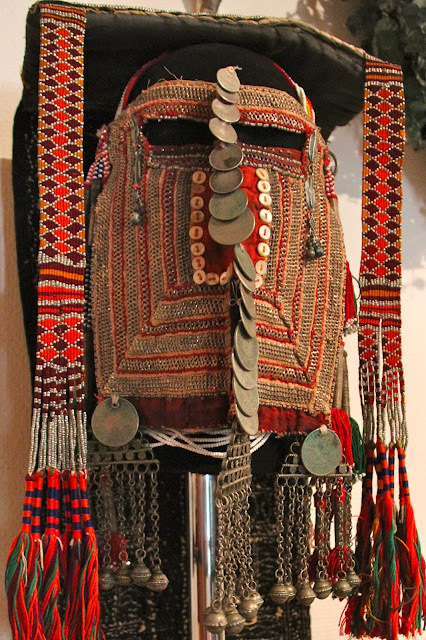 Bedouin women wore many different kinds of headdress and would often place one over the other. 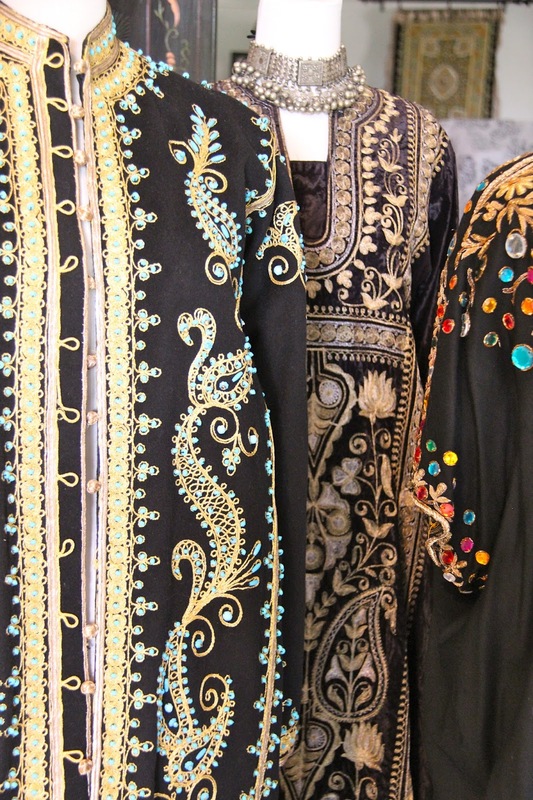 Layering was a characteristic of Arabic dress. Bani Sa'ad women sometimes wore up to seven layered items on their head. As Pamela tells me this this, she places a flat-topped head dress over the burqu. This is called a ridayah and its square flatness makes me think of a mortarboard, but there the similarity ends. There’s nothing plain or simple about this. Two fabric pendants in shades of red, with metal beads and tassels hang down from each corner, framing the face. The other end trails over the back of the head, and is finished off with yet more fringed brightness. When I spread it out flat I see that it’s just a simple rectangle, covered in metal beaded embroidery. Bedouin girls and women must have spent hours fashioning all these trimmings. 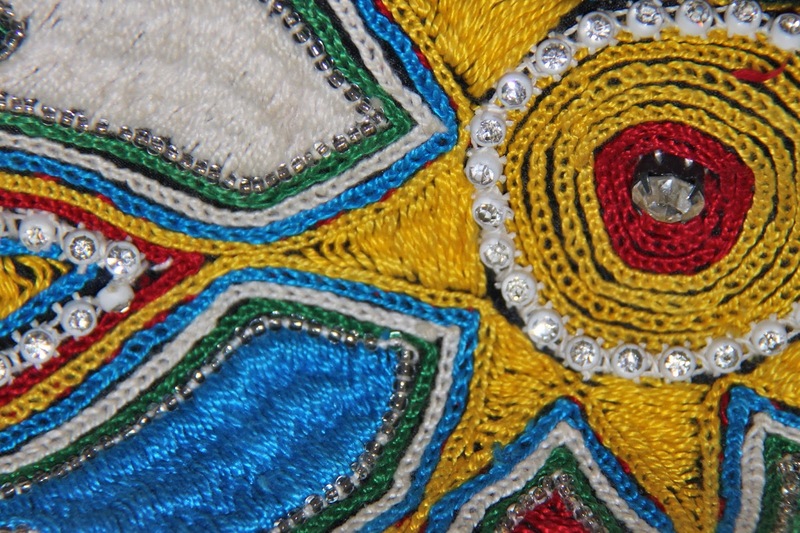 A beaded head cover called a buknuq, another step in the layering process. The next dress is different. It would have been made for a woman living in a city, probably Riyadh, because it has features that are typical of Saudi Arabia’s central Nadj region. In this area the basic kaftan shape grew into something more fluid and sophisticated, while still retaining the traditional thobe square cut. The tailoring is Indian and Pamela explains that Indian tailors were part of the souk. “You'd see them in their shops along Deira Street, sitting cross-legged on the floor, with fabric stretched out in front of them on narrow looms. They’d draw the design on first and then do the stitching." Made of pure silk chiffon fabric, the workmanship and delicate metal thread embroidery all suggest the emerging wealth and status of Nadj families like the Al Sauds. 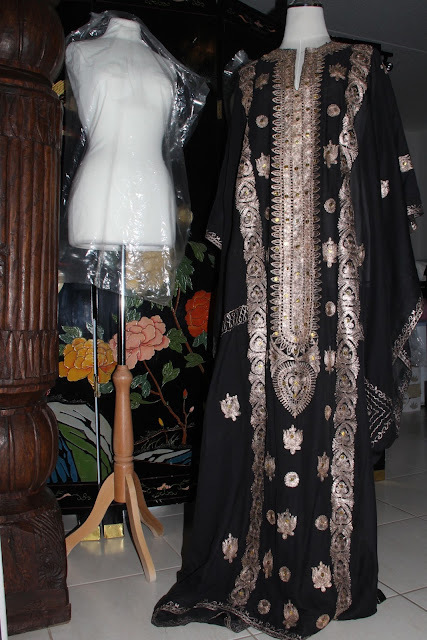 A black woolen coat is next in the mannequin line up, this one hand embroidered in a style that’s known as Zardozi. 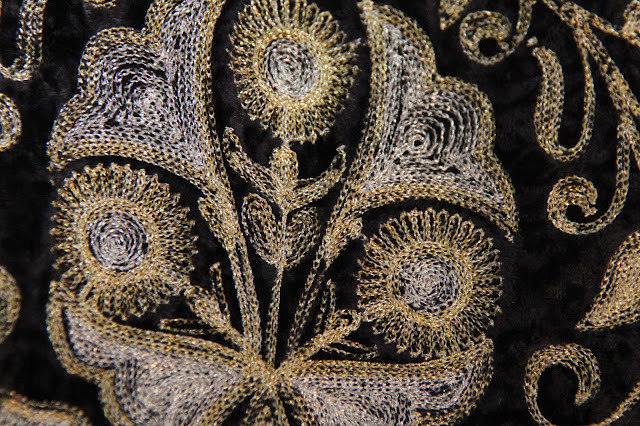 Zardozi is traditional metallic embroidery technique. In Persian zar means gold and dozi, embroidery. Intricate patterns were traditionally embroidered with gold thread and then further embellished with precious stones. However here, the thread is not gold and the beads just coloured glass, but the design and workmanship are still outstanding. Beside it is another dress from the same Nadj area, made from black velvet. The embroidery is a similar paisley design, but this is machine sewn. The last gown I look at has a style of embellishment that is derivative of Syria or Turkey. 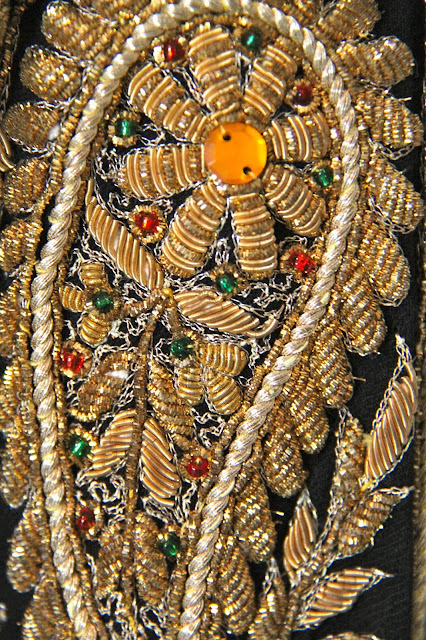 It has gold, metal thread buttons and a narrow, flat decorative braid either side of the front opening, known as soutache. The stand up Nehru collar and turquoise coloured beads add to the overall air of sophistication and wealth. It is completely hand embroidered, with loops and flowers made from braided metal thread, and couching: a technique where one thread is fixed to a fabric by stitching it down flat with another thread. Looking at it, I can imagine the grace and beauty of the wearer. Like other well-to-do Nadj women she would have wanted gowns that were opulent and extravagant with as much shine and shimmer per square centimetre as possible. And now it's time to leave. The cat that’s been viewing me suspiciously from the next room leaps down and strolls past, brushing my leg. I’ve been in her space for too long. One day though, I’ll be back. 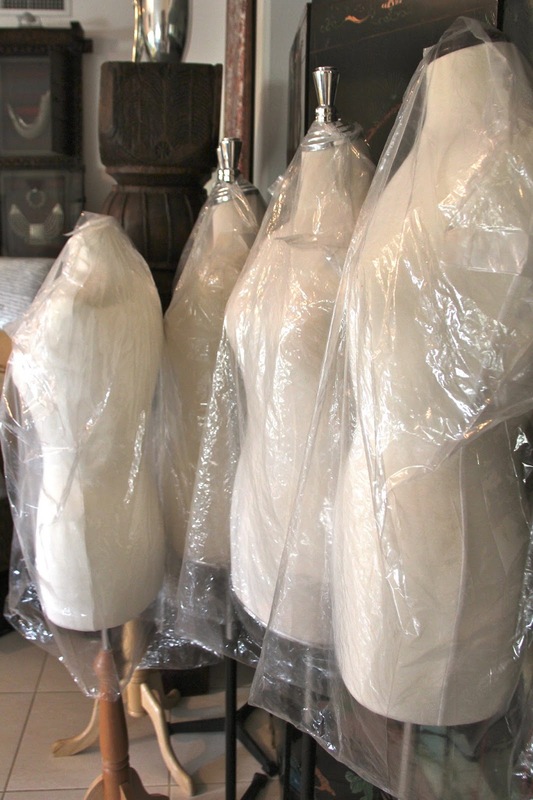 There's mannequins and still more dresses waiting. Thanks. The Princess Souk has changed a bit over time but still has some pretty amazing dresses. Visiting with friends is always fun.